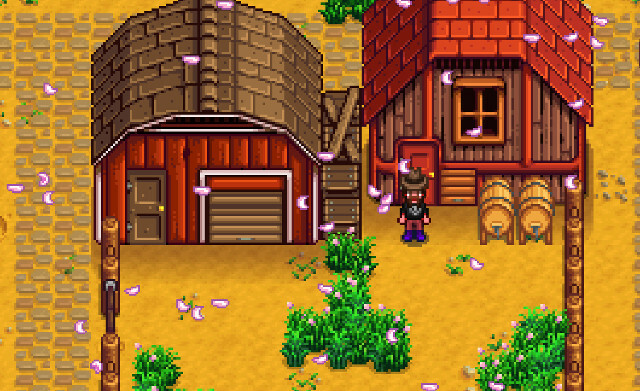 Stardew Valley seems like a pretty simple game at first, but once you dig in you’ll find a deceptively complex, deeply layered experience. In my first save file, I spent a lot of time trying to figure out how things worked, and by the time I made it to Fall, I had learned an enormous amount of information that, had I known it when I started the game, would have saved me a lot of time and headaches. So I started over and had a very successful first year. Yes, you can enable autorun in the options menu. It will save you from cramping your pinky finger by holding down Left Shift all the time. As you harvest crops, catch fish, scavenge berries and so on, you earn advancement points that cause your various skills to level up. This is based purely on what you sell at the end of each day. So, if you kill a bunch of bugs and keep the Bug Meat they drop (which you can use to craft bait), you won’t get XP until you sell their drops. In your first season, you’ll be tempted to begin saving your money for some of the cooler items in the game, like additional backpack space. Don’t save a single g if you can help it. Spend yourself broke every single day by buying as many seeds as you can. You can buy parsnip seeds for 20g and sell a harvested parsnip for 35g. 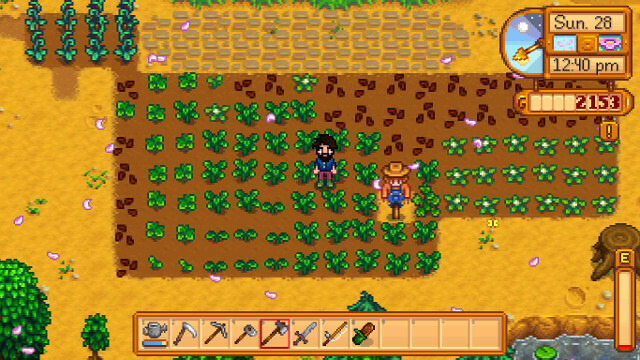 If you plant 5 seeds your first day, you’ll earn 175g from your first harvest (more than that if you end up with silver- or gold-star versions of your crops). If you invest that back into parsnips, you’ll be able to buy 8, which will yield a harvest worth 280g. Now, let’s say you invest your entire starting 500g into parsnips. You’ll get 25, yielding a harvest worth 875g. Invest that back into parsnips, and you’ll get 43 for a harvest worth 1,505g. Notice that this investment gives you a net gain more than 5 times greater than you would have under the first scenario. And this can be stretched even further when you start buying crops that can be harvested multiple times. In my first save file, I played very conservatively, only buying a few seeds at a time. At the end of the first season, I had maybe 1,500g saved up. 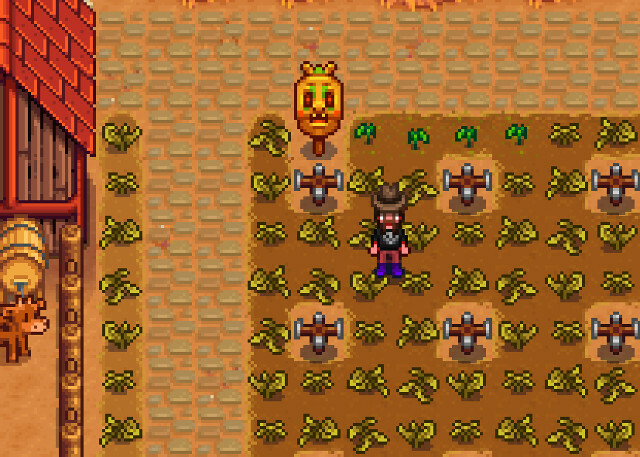 In my second save file, I spent all of my money on seeds for the first two weeks. By the first day of Summer, I had purchased several buildings, upgrades, and other random items, and I still had well over 10,000g saved up to begin a very strong Summer. On the first day of Summer, all of your crops will die, so plan accordingly. If there are only 5 or 6 days of Spring left, you might want to stop planting anything new until Summer comes around. This will happen at the end of every season, though there are certain crop types that last multiple seasons. If you plant corn in Summer, for example, you can continue to harvest it until the end of Fall. 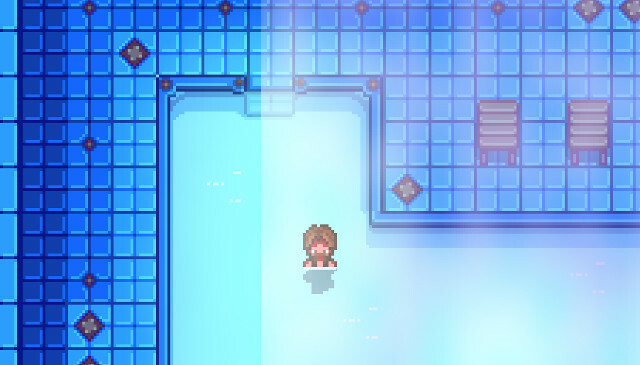 What the earthquake actually does is unlock the spa, which lets you take a dip in a warm, steamy bath to regain your energy. If you spent your Spring running out of energy before the clock would strike noon, the spa will be quite welcome. To find the spa, just head north from Robin’s carpentry shop. There are several types of fertilizer in Stardew Valley, and many of them are crafted using extremely plentiful resources like stones and tree sap. Different types of fertilizer grant different bonuses to your crops, so experiment with them to see how well they work. Fertilizer must be placed in soil before seeds are planted, and soil will become unfertilized whenever it becomes un-tilled. 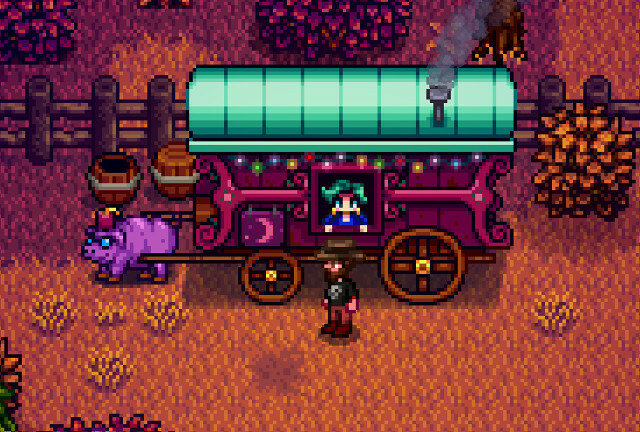 Admittedly, I should have paid a little more attention in my first playthrough. I upgraded my watering fairly early on, but it didn’t seem to do anything. Just clicking a crop will still only water a single tile’s worth of soil. The key to the bronze watering can is to hold the left mouse button until you see some tiles highlighted. When you release the button, you’ll water three tiles instead of one. (The same goes for the copper hoe.) Obviously, this range will keep increasing as you keep upgrading your tools. I cannot even begin to explain how much time and energy I wasted by not figuring this out right away. The television set in your home will display various programs that can help you out. The weather is good to know in advance to plan out your next day. Livin’ Off the Land will give you helpful tips and may even let you know about some of the big events that aren’t listed on your calendar, like when Spring onions are ripe or when Crab Mating Season begins. 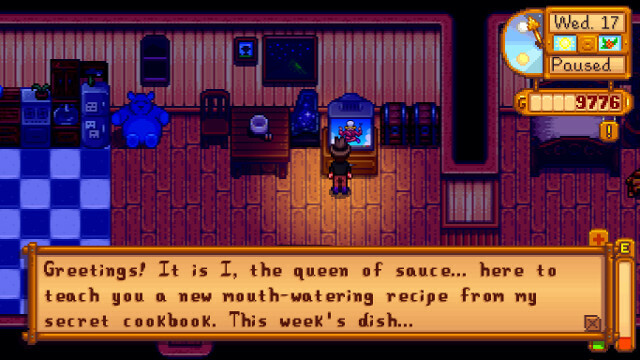 The best show of all, though, is The Queen of Sauce, Stardew Valley’s cooking show, and catching a new episode will often unlock a new cooking recipe. As you begin to explore what’s left of your grandfather’s farm, you’ll almost certainly stumble upon the ruins of an old building. 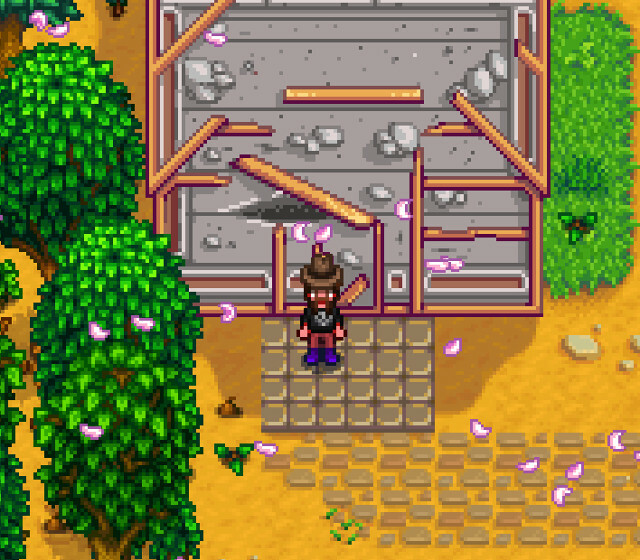 This is an old greenhouse, and you’ll be able to have it rebuilt by completing bundles in the Community Center or purchasing it for 35,000g at JojaMart. You might discover an old relic called an ancient seed. This seed, when planted, will grow into a vine that sprouts very expensive fruit. You can’t really do anything with this fruit besides sell it for large amounts of g, so it’s purely there for you to profit off of. Just make sure you plant your ancient seeds inside your greenhouse, because otherwise they will die off once Winter comes. Plan ahead. Before you place your first building, you’ll probably want to come up with a visual layout for where exactly you want your buildings in relation to one another. If you decide you don’t like where you put something, your only course of action is to demolish the building and rebuild it, a process that will end up costing you quite a bit of g and resources. The first building you’ll want to build is a silo, which allows you to store the grass you cut down with your scythe as hay. Since you’ll spend a lot of time in your first Spring cutting grass, you’ll want to have a place to store it all so that effort isn’t wasted. 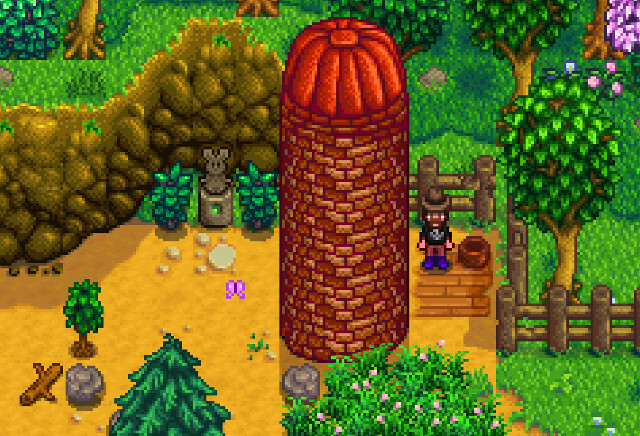 You’ll have a quest to build a chicken coop, and you’ll absolutely want your silo up before your coop. Otherwise, you won’t be able to feed your chickens without having to buy hay from Marnie every day. The most difficult part about erecting a silo is finding enough clay. You will need 10 lumps of clay, and they can be pretty evasive in the early stages of the game. 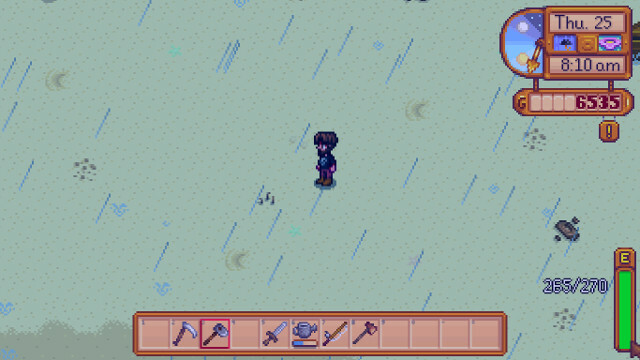 As you explore the world of Stardew Valley, you’ll stumble upon clusters of dancing earthworms. Their presence marks hidden treasure, which can be coal, lumps of clay, rare artifacts, lost books, and more. Simply use your hoe to unearth the treasure beneath them. Okay, so the game refers to them as twigs, but they still look like earthworms to me. Twigs don’t dance! The first time you try to fish, it seems close to impossible to catch anything, and trying to match up the green bar with where the fish is swimming is an exercise in frustration. Don’t let yourself be discouraged. The learning curve is steep, but after several tries you’ll find yourself getting used to the strange minigame and you’ll be hooking fish like a pro. 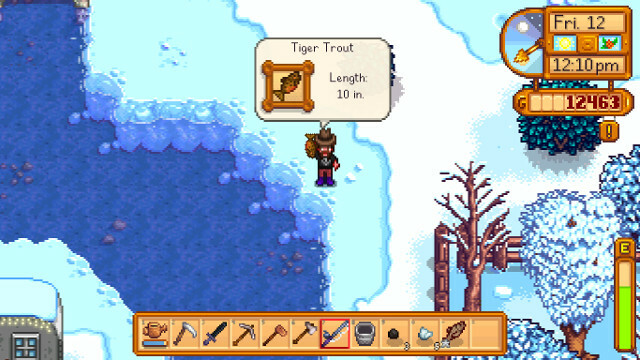 Once you start leveling up your fishing, your green bar will grow larger, making it easier. You can even eat certain types of food that will temporarily increase the size of this bar. Plus, various types of tackle will make your job easier once you start upgrading your rod. For example, the Trap Bobber will reduce the rate at which your bar decreases when you’re not lined up with a fish. All of that junk you catch while fishing — like broken glasses, soggy newspapers, and more — actually has a point. Once you hit fishing level 4, you can craft a Recycling Machine, which will turn you trash to treasure (like ores and refined quartz). If you’ve got the storage space, hang onto your garbage until you’re ready to recycle it. Every Friday and Sunday, a bespectacled pig parks a traveling cart near the forest south of your farm. If you head south from your farm, head west as soon as you enter the next area (the area where Marnie’s farm and Wizard’s tower are). You’ll find the traveling cart parked at the north edge of this section. 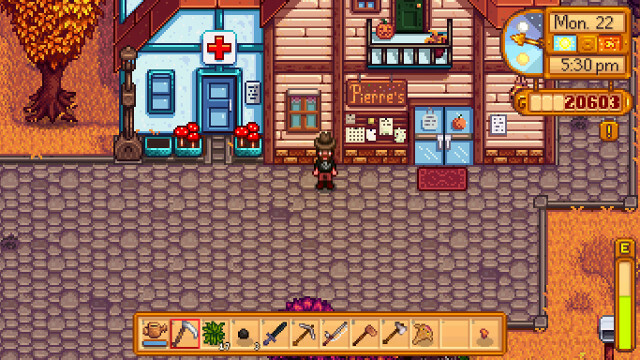 Prices may be steep, but you can buy items that are extremely rare here, including items you need to complete bundles at the Community Center. Sometimes, a little shopping spree can save you hours and hours of waiting around to find a particular item. All of these tips are things I learned myself by playing the game for well over 40 hours and experimenting with various aspects of it. There are several other lists of tips out there — PC Gamer has one, Kotaku has one, Game Revolution has one, there’s a huge reddit “megathread,” etc. The tips on my personal list are the things that would have helped me out in my playthrough rather than things I’ve cannibalized off other lists, so feel free to use my list or any of these others. There’s a ton of information out there, and the most important thing is that you enjoy the game. I looove this game. I’m hopeful for an expansion pack that can add all kinds of stuff. They’re still talking about adding co-op multiplayer, so we’ll see how that works out. I freaking adore this game as is, though. It’s so great! I made it to Summer – Year 2 on my 2nd save file now, and it’s still keeping me hooked like crazy!